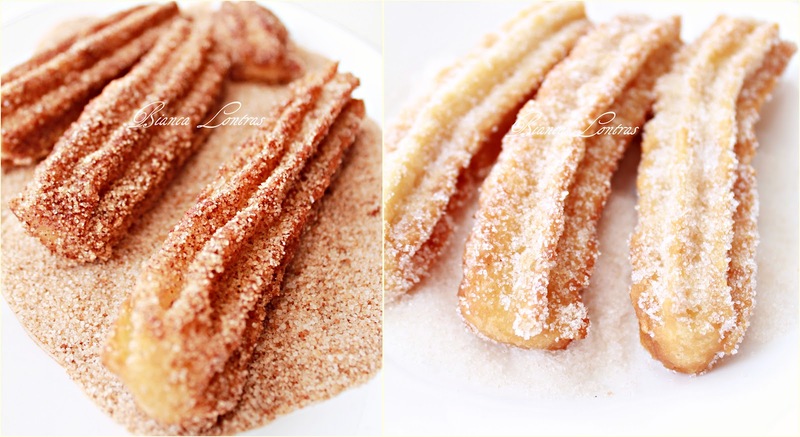 Churros are popular in Spain, Latin America, France, Portugal and the United States. I was so curious about their origin, so I search the internet to see what I can find out. Well, all of the websites (including wikipedia) state that the history is divided on how exactly Churros came to exist. Some say they were invented by Spanish shepherds. They were living in the high mountains, with no access to bakeries, so they came up with churro paste - easy to fry in an open fire. Some others say that Churros were brought in Europe by the Portuguese sailors from Northern China, where they were called "You Tiao". They made adjustments to the technique of making them, as they couldn't learn the Chinese skill of "pulling" the dough. So, they were passing the dough through a star shaped tip. Eventually the Churros were introduced in Latin America by the conquistadors and suffered various changes. The Spanish recipe has only flour, water and salt. But any recipe found on the internet originated from Mexico had butter and eggs added. I even watched a video on youtube with Gordon Ramsay making Churros after the original Spanish recipe. In one of the comments there, someone was very surprised as how come Gordon, being a top chef, doesn't know that the original recipe has eggs and butter in it. He grew up in Mexico and he knows the recipe well. Place the water and salt in a pot and bring it to boil. Then add all the flour and mix well until a consistent dough is formed. Remove from heat and continue mixing until smooth. Let the dough stand covered for about 15 min, to cool down. Heat the oil at 180 degrees C in a large frying pan. Place the dough in a churrera or a pastry bag with a star shaped tip attached and squeeze out about 20 cm long churros straight into the hot oil. Fry them until golden brown, on each side. Place them on kitchen paper to absorb the excess oil and while they are still hot, sprinkle with sugar or cinnamon sugar. Serve them immediately with hot chocolate sauce. Same method as the Spanish ones, just that the butter is placed in the water mix. After the butter is melted and the mixture is almost at the boiling point, place the flour and mix until the dough releases from the sides. 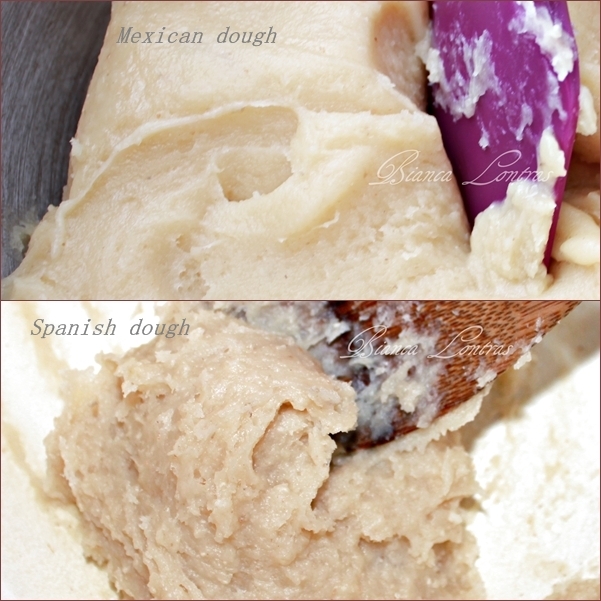 Remove from the heat and place the dough into a table top mixer. 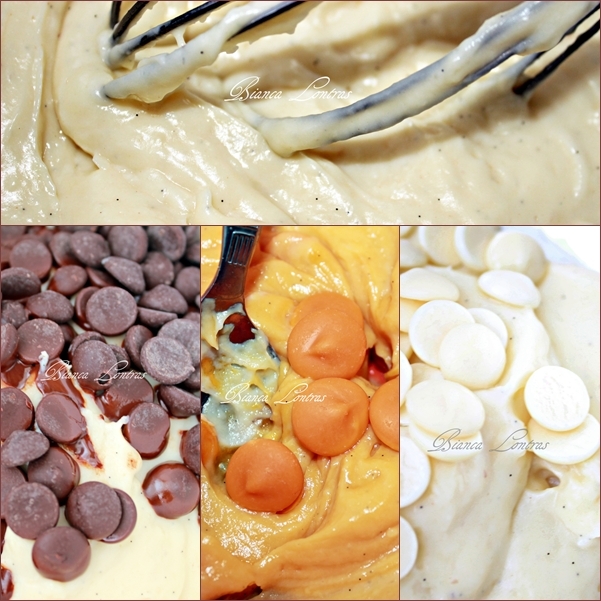 On a low speed, mix the dough, adding one egg at a time. Leave the dough covered for about 15 min, to cool down. These ones I chose to fill with creme patisserie (pastry cream) mixed with chocolate, then covered them in chocolate and sprinkled them with coconut, nuts, chocolate and colored sprinkles. Which ones I liked the most? Has to be the Mexican ones, as they are moist and soft, compare to the Spanish ones that are crunchy outside and a bit chewy inside. Cristi, cu cea mai mare placere ti-as pune la posta si mai multi, nu doar 4 :)) Dar pana ajung ei la tine, se racesc si sunt buni calzi. Felicitari pentru tot ce faceti!Va urmaresc mereu si ador stilul vostru! Foarte apetisanti sunt. Imi place tot ceea ce faceti. Sunteti extraordinari amandoi. bafta!! O rugaminte..nu scoateti cuvintele de verificare??? These look amazing! I'm having a huge craving for churros today!